New Delhi Missed traumatic pancreatic injuries especially injury to the main pancreatic duct (MPD) is a small but significant cause for morbidity and mortality. Blunt traumatic pancreatic injuries may pose a major diagnostic challenge to the surgeon during exploratory laparotomy and one of the leading challenges is to adequately expose the pancreas. So, is there any ‘simple’ operative sign /clue which points to the high probability of pancreatic injury in such settings without initially exposing the whole pancreas? Can pancreatic exploration be avoided in absence of some intra-operative clues? Is there any intra-operative sign which anatomically points to the place of injury in the pancreas where the search for MPD injury should be made? 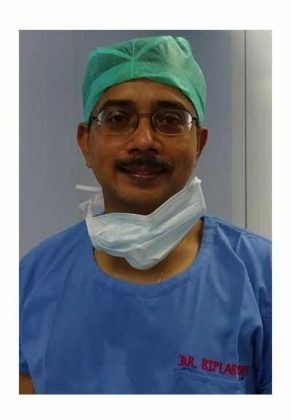 Hopefully there is a sign which may at least partially fulfill our expectations- Dr. Biplab Mishra, Professor at the Department of Surgery AIIMS, has proposed ‘Mishra’s sign’ and defined it as: ‘intra-operative evidence of laceration/ contusion/hematoma in the lesser omentum just around the pyloroantral region along lesser curvature of the stomach in blunt traumatic injuries suggesting potential injury to the neck or around the neck of the pancreas’. 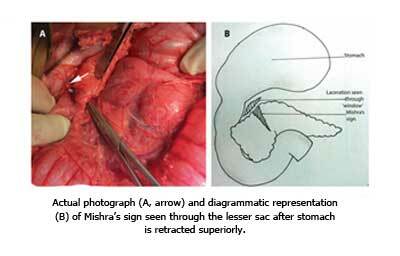 Dr. Mishra has operated more than 20 cases of pancreatic lacerations and have observed this sign in most of the cases. After a thorough search of the literature and to the best of his knowledge, nowhere he could find the proper description or mention of importance of this sign. It is also highly probable that surgeons operating upon traumatic pancreas have observed this sign but mention of its significance is somehow overlooked in literature and surgical teachings.